Introducing my new blogger template, adopted from revolutiontwo WP themes and I convert it to magazine style. At first I add slide show, but I decide to remove it, maybe for next template. Easy to customize, simple navigation bar. duh pengennya aku ganti kulit, tp klo inget error2nya mules.. eh males jadinya. I really like this template and it might become my next default one. 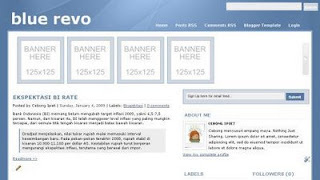 a) IE7: If you maximize the IE7 browser window at http://bluerevo.blogspot.com/ you will discover that the header section is not centered any longer. This works in FF or Chrome as expected. b) IE7: The search field is above the header section and not in the header section. This might cause problem a). Very good staff, I am under that I downloaded from, I know how to change the header for an image which is the name of the blog, thank you very much. This was the absolutely best template there is out there, I mean for me. This template got me into blogging really, but I have some problems with the headers, it doesn't fit, there's a break in the header. I've been trying to correct it, but I can't really figure out what it is. If you've got the time to help me, I would be really glad. It's where the text: "Jag är Marcus Sundman, 24 snart 25 år gammal, blivande sjökaptensstudent. Har alla körkortsbehörigheter, är gammal unix-nisse. Kommer skriva om allt som faller mig in. Kan bli om sådant som redan hänt mig som är värt nämnas, eller nya upplevelser och historier. Häng med mig!" is situationed, I want the background white and formatted with the main parts. Would you help me please? Thank you very much. ScreenshotIf this is okay I can send you my changes tonight. Need to leave now.